SUBHEAD: The government from Tokyo to the prefectures are saying illnesses are from stress, there’s no radiation. 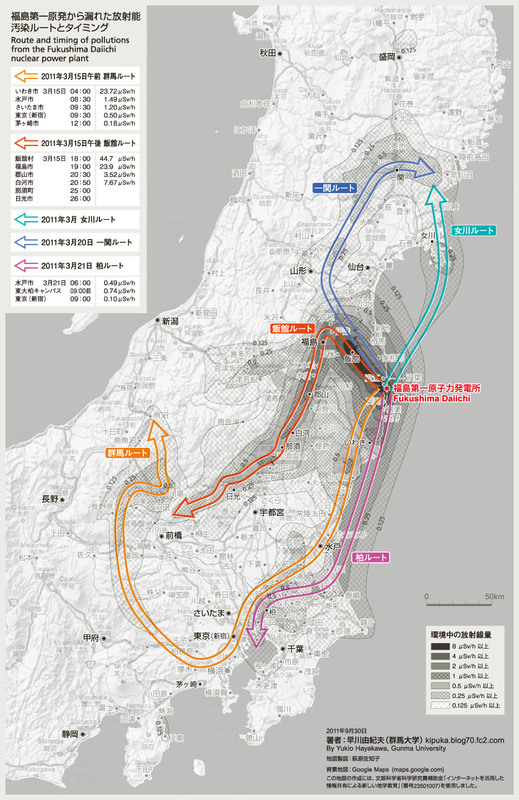 Image above: Detail of map of by Yukio Hayakawa, Gunma University of Fukushima Dai Ichi radiation contamination in the weeks after multiple nuclear plant meltdowns began in March of 2011 after devastating tsunami. Click to enlarge. From (http://www.hayakawayukio.jp/pub/2011/route930.jpg). 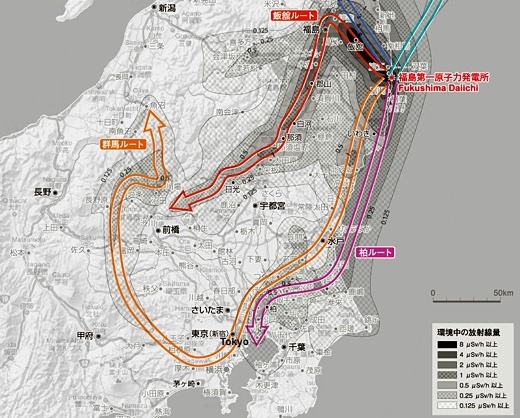 Origina map indicate that on 3/15/11 (orange path) and 3/21/11 (magenta path) that Tokyo received the most fallout radiation. I believe the government has the responsibility to evacuate these entire communities… the government decided to leave them exposed to the real danger of radiation. [W]hen it comes to radiation… “removal of contaminants” is impossible… This stuff contaminates everything. [During my recent trip to Japan] I met in one of the resettlement areas… The unofficial mayor of this group – a real dynamo of a woman – she experienced hair loss, bloody nose, speckles on her skin and the doctors told her it was stress and not to worry about it. That’s not stress. It was radiation damage. But again, that’s this inhumanity that I was experiencing… Every time I turned around, I saw people that definitely experienced radiation damage. We had one woman who ran from her house to evacuate carrying her dog. About a day after the accident, they realized that she needed to be evacuated. And so she runs barefoot to her car, gets in her car, drives to the resettlement community. She’s highly radioactive. They make her – especially her feet – they make her take her socks off and take showers, wash her down before they let her in. And her feet were black for three years from radiation damage. And that’s not being spoken about in any of the medical journals… [The government wants] to get these other nuclear plants up and running. And if the population is getting ill from radiation effects, it’s a lot harder. So they have… banded together with the medical community. We had numerous doctors say that they were going to lose hospital privileges and things like that. And the people that are keeping track of deaths in Fukushima Prefecture aren’t publishing the data. Were it not for the internet, they would have won. And I think the difference between the disaster at Fukushima and the disaster at Chernobyl and TMI is that now we have the internet. It still is an unlevel playing field. There’s still so much money on the other side of it that people are being brainwashed. Oh, that bloody nose you’ve had for the last 3 weeks is stress. So they are being brainwashed. (at 6:45 in) Professor Kim Ik-Jung, Medical College at Dongguk University: “When you look at the contamination map, about 70% of Japan is contaminated by radiation. That means that 70% of Japan’s agricultural and marine products are contaminated.”… According to PNAS, one of the five major scientific journals, over 70% of the land in Japan is contaminated by radiation. Video above: Presentaion of Naoto Kan on contamination of Japan by Fukushima Daiichi disaster. From (https://youtu.be/Q4kwR6wpw2g). As we know from Chernobyl, not just a couple of weeks, but 30 years or 40 years — it would have virtually meant the end of Japan. Half the population was subject to radiation [Japan Population: 127 million]. That’s something that could just be imagined, for instance the event of losing a major war. It looks bleak. Big deal. What's going on with the Banks?